ASG integrates renowned X-PAQ and Auto Feed System with Cobot delivering a new era of assembly automation; dramatically increasing Production Time. The addition of the XPAQ SD2500 to a collaborative robot provides a dynamic work cell with humans and robots working side by side. The merger of collaborative robots with highly specialized end effectors like ASG’s SD2500 torque driver helps bridge the leap from Industry 4.0 to 5.0. ASG is proud to announce the integration of their X-PAQ precision fastening system and premium auto feed with a collaborative robot. As two of ASG’s front running products, the “triple threat” of adding a cobot provides a new, intelligent way to streamline the assembly process and assist operators. The easy-to-use system works effectively with operators; while being versatile to your application needs. This set-up can be used with most cobot platforms. The ASG Precision Fastening X-PAQ system is a torque and angle controlled brushless DC electric tool system. The focus of this system is to offer an affordable precision torque control and data management system with intuitive and user-friendly programming. The Premium Auto Feed system automatically sends screws from the bowl to the screwdriver. The positioning and tightening of the screw on the work piece is semi-automatic, eliminating the need for the operator to manually pick up the screw. 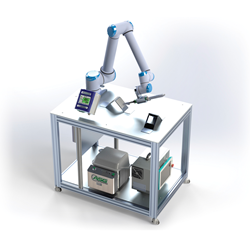 This auto feed was designed for the integration with a cobot. ASG is ISO 9001:2015 certified as well as an RIA Certified Robotic Integrator. They have been offering products and solutions for the assembly industry for since 1976. A complete line of torque control products and precision fastening equipment is offered through ASG Assembly, Industrial, and Precision Fastening, and Automation product groups and includes electric and pneumatic torque control drivers, automated fastening systems, torque testers, work station accessories, precision screw presenters, automatic tape and label dispensers, the X-PAQ™ System, Integrated services, and more. For more information, visit http://www.asg-jergens.com or follow the company on Facebook, Twitter, LinkedIn and YouTube.